The human body is composed of trillions of cells – these cells make up your skin, hair, lungs, and even your toenails. 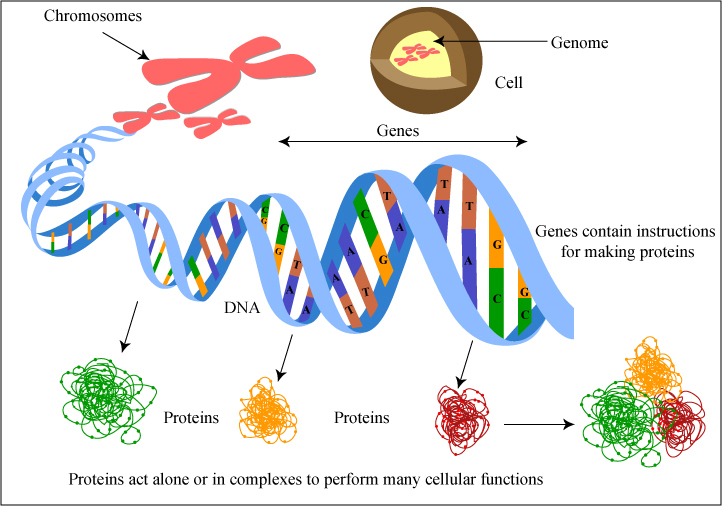 Inside each of these cells are specialized instructions that are essential for life, otherwise known as deoxyribonucleic acid, or your DNA. But what exactly is DNA? Quite simply, your DNA is a long string of four different molecules that are ordered to create a specific message, in the form of a gene. 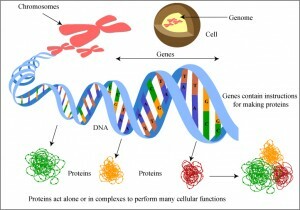 While each gene is composed of the same four different types of molecules (nucleotides), their arrangement (sequence) is unique to you, like a fingerprint. The genes in your DNA are made into proteins and are what made your eyes blue, your muscles better for sprinting, and even decided whether or not your earlobes are attached or free. Unfortunately, while essential for life, certain changes to our DNA that lead to genes not functioning properly can also cause cancer, color blindness, or Alzheimer’s. Scientists continually strive to identify what genes cause human diseases, and then use this information to create better therapies for patients with these diseases. To aid these efforts,, scientists began the difficult task of successfully sequencing the human genome in the early 1990s. In other words, they were going to identify the complete arrangement of functional genes in human DNA. After 10 years, the completed project resulted in the identification of ~20,000 functional genes in the human genome – surprisingly, about 10,000 fewer genes than less advanced organisms such as fleas or grape plants. An even greater surprise to scientists was discovering that these ~20,000 genes only make up 2% of our human genome. What then, is the other 98% of our genome made of, and what does it do? Scientists now know that this 98% of our genome is composed of elements known as non-coding DNA (ncDNA). ncDNA are parts of DNA that do not make proteins, like the other 2% of our genome. There are many different types of ncDNA in our genome. One specific type is referred to as non-coding RNA. Non-coding RNAs (ncRNA) have the incredible ability to control which genes in our DNA become proteins at a given time in the cell. For example, the protein created from gene “A” functions to make cell size increase. However, the cell doesn’t have the proper nutrients it needs to grow and therefore should not continue to increase its size. 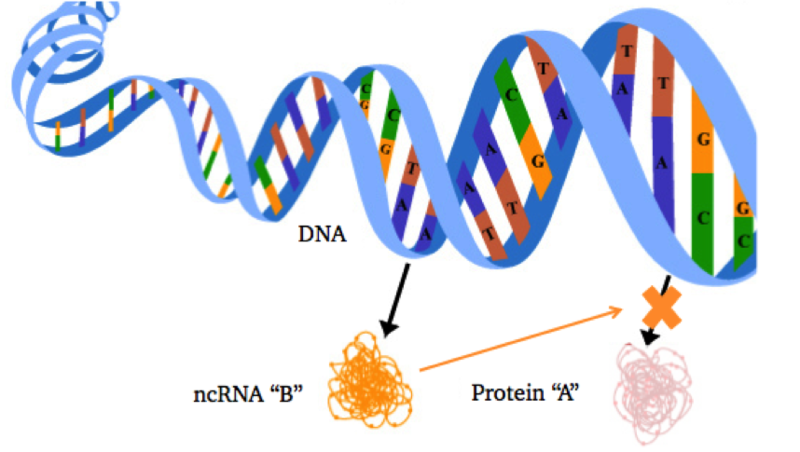 Sensing the lack of nutrition, the cell turns on ncRNA “B” to intervene, prevent gene “A” from making protein “A”, and thus saves the cell from trying to grow when it shouldn’t. These interactions between ncRNAs and the products of our genes are a critical part of the normal functioning of our cell. They can be extremely important for preventing the production of proteins that may cause disease, however, when these ncRNAs stop working properly, they can also lead to disease. Scientists are now conducting research to better understand these ncRNAs and how they can target specific genes and proteins. The hope is that we can use these ncRNAs to stop the production of proteins that lead to complex diseases, such as cancer or Alzheimer’s, resulting in new and improved treatment options for patients. Thus, while the idea that fleas have more genes that become proteins than humans at first seemed discouraging or humbling, we now know that this is compensated with an incredible and complex amount of ncDNA. Scientists have only scratched the surface of what this other 98% of the human genome does and what role it plays in human health. While discoveries are made everyday, more research still needs to be done to discover what other secrets the human genome contains.